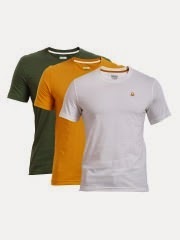 Here you can get United Colors of Benetton Tees for Men in Pack of 3 worth of Rs.1199, can be get it at Just Rs.799 only. Please hurry to take the advantage of this discount offer. Enjoy the deal with UCB Men Tees.